The Pediatric Brain Tumor Foundation, the world’s leading nonprofit dedicated to children with brain tumors, joins the childhood cancer community in celebrating the signing of the Childhood Cancer Survivorship Treatment Access and Research (STAR) Act into law. You can find a summary of the new law, signed on June 5, 2018 by President Donald J. Trump, below. Expand opportunities for childhood cancer research: The Childhood Cancer STAR Act authorizes the National Institutes of Health (NIH) to provide support to collect the medical specimens and information of children, adolescents and young adults with cancer in order to achieve a better understanding of these cancers and the effects of treatment. Improve childhood cancer surveillance: Building upon previous efforts, this legislation authorizes grants to state cancer registries to identify and track incidences of child, adolescent, and young adult cancer. Improve quality of life for childhood cancer survivors: The Childhood Cancer STAR Act will help expand research into the late effects of childhood cancers, improve care coordination as survivors transition into adult care, and establish a new pilot program to begin to explore innovative models of care for childhood cancer survivors. Ensure pediatric expertise at the NIH: The legislation requires the inclusion of at least one pediatric oncologist on the National Cancer Advisory Board, giving the childhood cancer community a louder voice. “The Childhood Cancer STAR Act is the most comprehensive childhood cancer legislation ever taken up by Congress. It puts policies in place that help ensure more gets done to change the treatment landscape and improve outcomes for children with cancer,” said Dr. Joanne Salcido, Vice President of Research and Advocacy at the Pediatric Brain Tumor Foundation, in response to the Childhood Cancer STAR Act's recent passing by the House of Representatives. The PBTF is grateful to the childhood cancer community's many champions in Congress, who successfully shepherded this bipartisan bill through both chambers. As a member of the Coalition Against Childhood Cancer, we were proud to play a role in advancing and advocating for this legislation alongside CAC2’s advocacy partner coalition, the Alliance for Childhood Cancer, and the rest of the community. Through our collaborations with these groups and other childhood cancer nonprofits, the PBTF strives to unify the pediatric brain tumor and childhood cancer communities in educating lawmakers and promoting the interests and needs of young cancer patients. The PBTF encourages families impacted by pediatric brain tumors and other cancers to reach out and thank their Senators, Representative, and the President for passing this lifesaving legislation. You can also tweet your representatives, asking for their support in securing the appropriations required to enact the provisions of this new law. 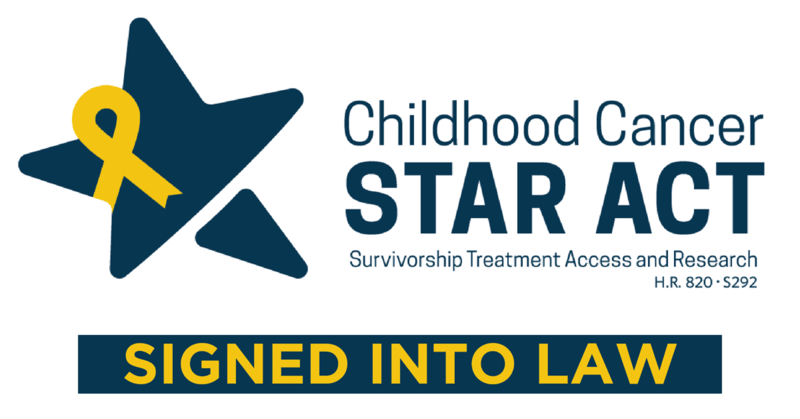 The STAR Act amends the Public Health Service Act to authorize the National Institutes of Health (NIH) to provide support to collect the medical specimens and information of children, adolescents, and young adults with selected cancers that have the least effective treatments in order to achieve a better understanding of these cancers and the effects of treatment.